Nike Air was first introduced 1979’s and since then this cushion technology was bread & butter for Nike brand. Air Max quickly became an irreplaceable part of basketball, running, tennis and even of lifestyle sneakers – they started to use Air everywhere. In this month, we’re celebrating the 30th anniversary of the Air Max – the innovation that forever changed whole sneaker game. To celebrate Air Max day, Nike made one of the biggest breathtaking sneaker events all around the world – it was super DOPE (shame that I didn’t have a chance to visit one of them). But the most awaited part of the Air Max anniversary was the release of highly anticipated and most hyped sneaker – Nike Air Vapormax with completely redesigned Air Max cushion setup. 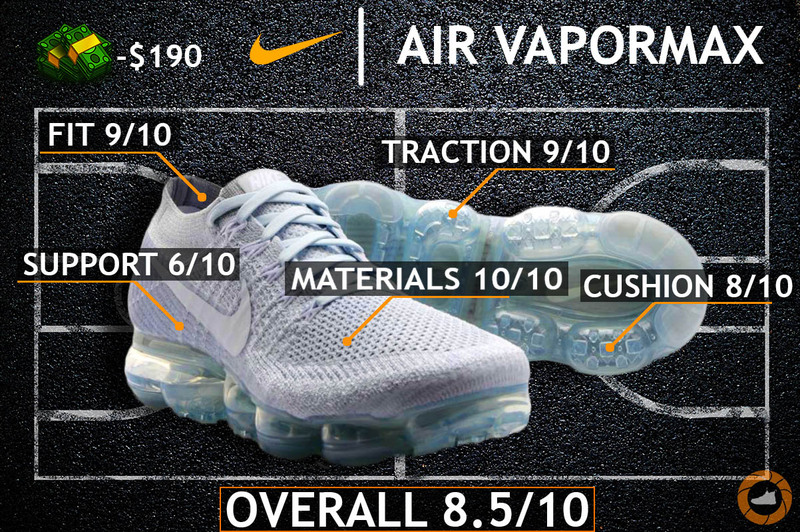 I was blessed with a pair of them (shout out to my friend), so today I’m giving you my Nike Air Vapormax Performane Review! Can they beat BOOST? Let’s find out! Best Places to Buy: FINISH LINE | AMAZON | GRAB THEM BEFORE THEY ARE GONE! The Nike Vapormax has very similar upper to the Nike Flyknit Racer yet they felt completely different. The Vapormax has super light Flyknit upper with Fuse overlays in high wear areas. Starting from the toe box – we have the loose knit pattern for superb breathability, but the knit actually gets tighter as it goes towards the heel area, where the knit pattern become super tight and with thick Fuse layer makes something similar to the external heel cup. Now let’s talk about the most hyped aspect of the shoe – the new revolutionary Air cushioning technology. As you can see there isn’t really a midsole to this shoe – there’s just a couple different thin plastic plates that hold these giant Air units, crazy right? The thing that makes the Vapormax so special is that there’s basically nothing in between your foot and the Air units, so it’s really does feel like you are walking on clouds. Unlike previous Nike models that have used Air units, Vapormax is apparently more advanced because what Nike did is they strategically placed Air units in places where it’s most effective. In addition, the forefoot Air units are smaller than the heel units, so you’re getting more impact protection in the heel and less in forefoot. Although, when I first started walking around this shoe, it took me a little bit of time to get used to it because certain parts of the outsole felt really unstable, especially the medial side of heel area. I my opinion, Nike had overdone it – I never thought I will say that but at some point I felt that the heel unit was too soft and squishy for me (maybe it just because I’m a heavy guy). Still, you’re getting remarkable impact protection as soon as you touch the ground. 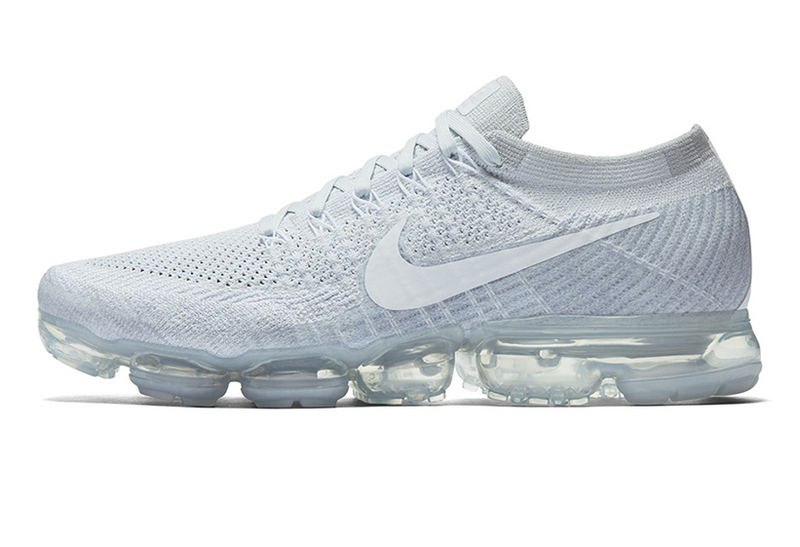 I don’t feel like the Vapormax is suitable for running, but I 100% positive that they are perfect for casual wear – cloud like ride guaranteed. One more thing, the rubber that encases the Air units is very thick & strong, so you shouldn’t have any durability problems at all – don’t worry the Air units are not going to blow, unless you like jumping on glass shards. We have a pretty interesting traction pattern. As you can see, there’s a lot of dead space in between the Air units where your feet have no contact with the ground, so you need to have really solid traction on the small amount of surface area. Surprisingly, Nike pulled that off. Thick rectangles implemented on the outsole rubber actually gripped the ground nicely – I didn’t have any slippage problems whatsoever. You’re good to go on any surface – they got you covered. On top of that, after a week of using them, I couldn’t see any signs of wear and tear – so the overall durability of the outsole is pretty great. The Nike Vapormax is extremely light and super flexible shoe – it offers that lovely custom fit and the upper doesn’t restrict your natural feel movements – It feels like you’re actually wearing socks with some Air underneath. If you asked me, the Vapormax made the way in my top most comfortable sneakers of all time. Of course, after the adidas Ultra Boost – they are still unbeatable. Also, we have knitted collar which covers your ankle like a pullover – I had zero problems putting them on or off due to very stretchable material. So it doesn’t matter if you have a big or wide foot, you will put them on with no problems. Let’s talk about sizing real quick. If you have a wide foot like me, you should go ½ up since this model runs a little bit narrow. Now for others I recommend going true to size to get that perfect one-to-one fit. I will be short with this because they actually don’t have any support features. What we got is Flywire setup which holds your foot in the right position. Flywire strings help you to pull that tight fit and at the same time it secures your foot from rolling out of the footbed. As you can see, the last string goes towards the heel, so when you lace them up the last Flyknit string pushes your foot into the heel cup. Still, I was pretty happy with what they can offer in the support section (talking about the upper). Now, talking about the outsole – it’s a completely different story. As I mentioned before, the Vapormax doesn’t feature a midsole – not also it sounds crazy but it actually feels crazy. You see, there isn’t any stable surface in between your foot and those huge and super squishy Air units – for the first two days I was wobbling around like a men with high heels on 😀 The struggle was real… BUT when I finally learnt how to properly walk with them (it took me a few days), the Vapormax became my second nature. I will say it again – it feels like you’re walking on clouds. The main question is – are they better than Ultra Boosts? The answer is NO. In my opinion, BOOST technology is still in #1 place due to beastly impact protection, solid support and the ability to just kick back your energy. However, Nike made a huge step forward in the process to compete with the adidas main model. So, if Nike will fix some of the issues with that “Revolutionary” Air cushion setup, then the next model of Vapormax could possibly be as great as the adidas UltraBoost. Nonetheless, I really really recommend you to pick them up. I know, they are supper hard to get – The Vapormax was sold out in the first release day. Although, Nike will release the new colorways very soon – just be patient. So, if you have a chance to grab them – just don’t hesitate. 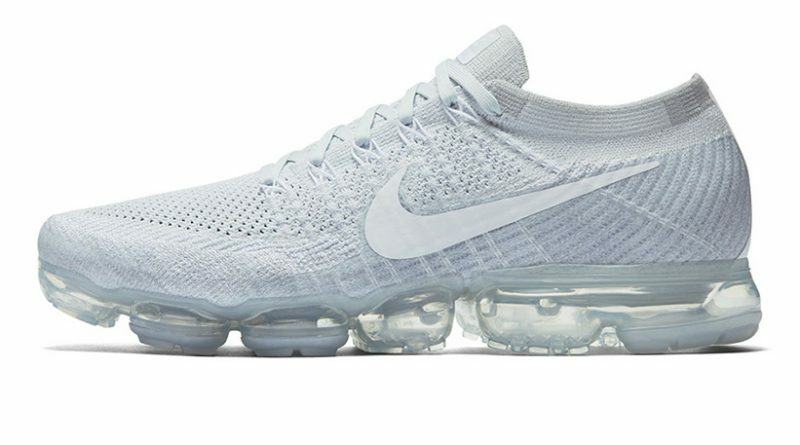 Especially, the summer is coming out, so the Vapormax is the perfect rotation sneaker due to great breathability, amazing comfort and overall lightness of the shoe. They are really unique – you need to have them. Hope you enjoyed my Performance Review on the NIKE AIR VAPORMAX. Will you be picking them up? Let me know! ← adidas Crazy Explosive Low Review – Can They Beat High Top Version? Great review on the nike vapormax! Thank you! I’m a long time air max fan! I appreciate it! If you’re a long time Air Max fan then I highly recommend you to pick them up – you will enjoy every second! Realy a ergonomic revolution in shoe design ! My grandfather was a shoemaker and he had also the same techniques to judge a shoe like you display on your site! He was a master shoemaker ! I think that the 30 years have to be celebrated fur such a great shoe that fits goed to the feet ! Super resitant, perfectly adapted for the quick moves in a basketball game ! It was a pleasure to comment your site and have a nice day ! Great choice man! You’re welcome my friend! You kept them in good condition for 16 years?? Damn, that’s very impressive stuff man! Ohh my God! Thank you for a great review on nike vapormax. This gives me more options for my particular needs for outdoor and sports outfit which is also fdit to my lifestyle without having the ultra boosts technology. This is a very helpful information indeed! Definitely, it will be a super nice rotation sneaker for sports and lifestyle – performance & style is on point. Sometimes you want to jump into something different from the adidas Ultra BOOST but at the same time have that awesome comfort feel, so these are perfect for that occasion. Wow! this shoe is amazing it has been a long time since I have bought a new shoe I will have to think about it thanks for the info though. Ohh you should! The VaporMax is one hell of a nice sneaker. I always want upper side of shoes to be really comfortable. I just feel great when I do sports and its weight is less than 9 ounces. I will definitely get one. 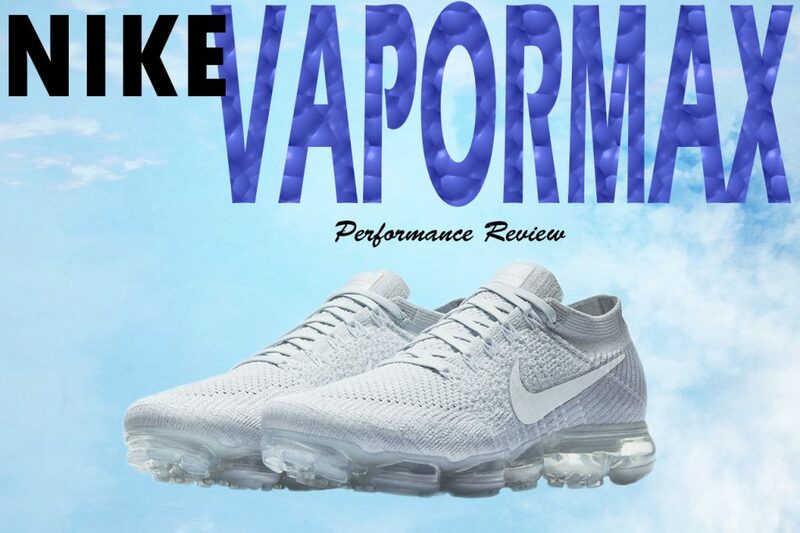 Hey Daumantas, great and very informative review of the nike VaporMax. I really did enjoy it a lot! Thank you for visiting my page! Now, the Nike VaporMax is originally made to be a running/lifestyle sneaker. So, for other sports I really DON’T recommend you using them because it may cause an injury. I recently got my first pair of Vmax (in a stunning blue orbit color). After a couple of days wearing them I noticed that the heel of my left foot was not properly supported by the trainer, feeling like is was swifting inwards. After a couple of hours walking on them my left heel was sore. I haven’t used them for running, just as a lifestyle trainer. I love the trainer style and some features, and I’ll keep it in my collection of trainers, but I’m not planning to get any other model of this trainer in the future. The only one in my mind is the Adidas ultraboost which looks dead confy! Seeing feedback on Finish Line and now your comment, I can tell that this is a major drawback for many people. It’s like lottery weather you will get a great pair of Vapormaxes or you will get that unewen fit and tons of disappointment. You’re really hoping to get nice quality and amazing experience while paying $190, that’s a lot of money. It’s a shame. The adidas UltraBOOST is my #1 lifestyle sneaker – unbeatable comfort, amazing BOOST cushion, breathable upper and no gimmicks like with the Vapormax. Thy woth every single penny you’re paying for them since the quality is PERFECT. So I highly recommend you to grab them! Everyone has its own personal taste and I respect that. Personally, I love ’em both cuz they go well with different outfits. Is this your first time picking up the Vapormax? They’re perfect for that man. Hi, thank you for your review. I was wondering if I could play basketball with Vapormax Premier Kit?! What is your opinion?! Hey, appreciate your support. The answer to your question is – A huge NO NO.